After a truly exhausting day of exploring the Road to Hana, we decided to keep Day 4 as low-key as possible. You be the judge. 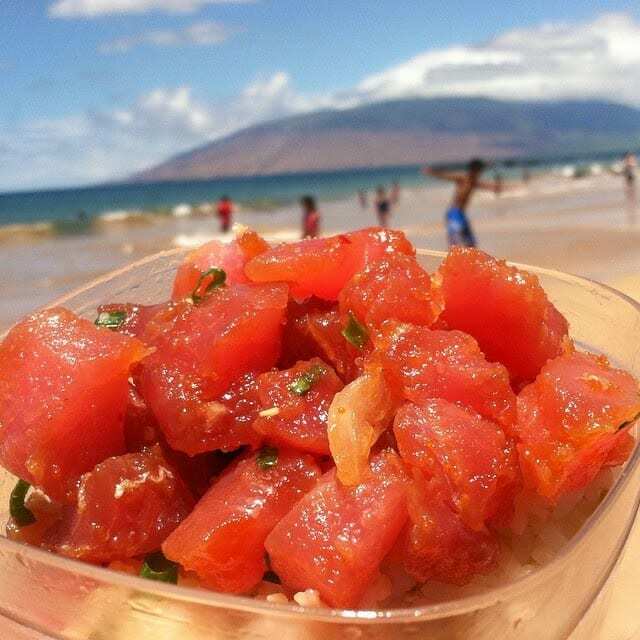 way to Foodland, I saw Kihei Caffe and I decided to take a quick peek. I didn’t really look at the menu, instead I went straight to the register and I saw these gigantic cinnamon rolls. The guy at the counter described them to me and allowed me to take pictures of it, I told him I wanted to get an idea what to eat at this restaurant. The rolls were covered but I can feel the warm heat, and it’s aroma. 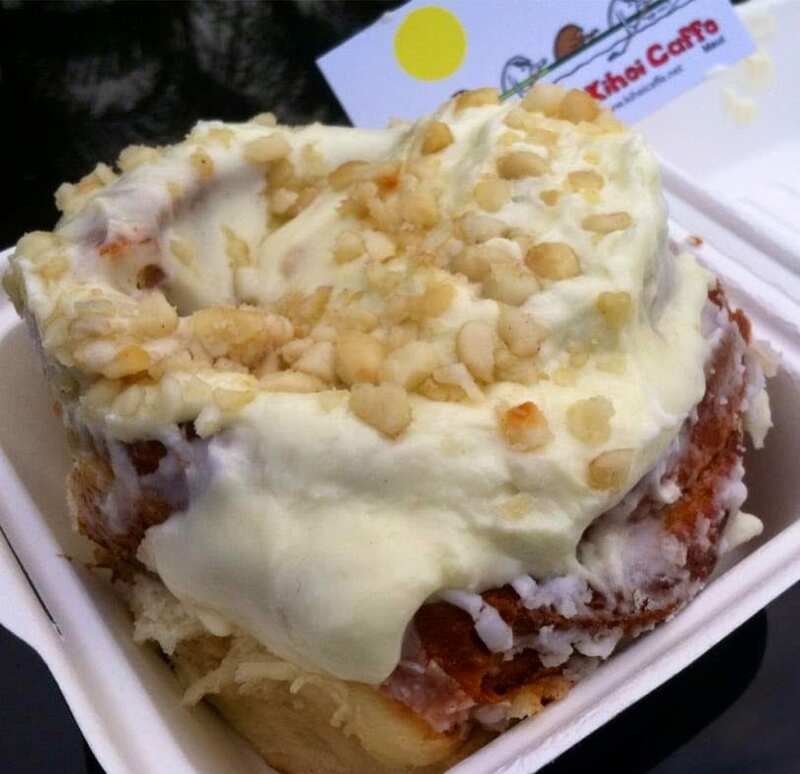 Right then and there, I changed my mind and ordered the Cinnamon Roll with Macadamia Nut Frosting topped with Mac Nuts. I caved and did not regret it. Directly after going to Kihei Caffe, I stopped by Home Maid Bakery again to pick up freshly-made malasadas. Why the desire to cook? Yesterday, as we were leaving for Hana, one of the kids found an herb garden outside the condo grounds. I saw the herbs that I love using – basil, rosemary, parsley, and cilantro. There were a few more but I just didn’t know which ones they were. So I knew that I’d be going back to this garden and create a little meal for the family. 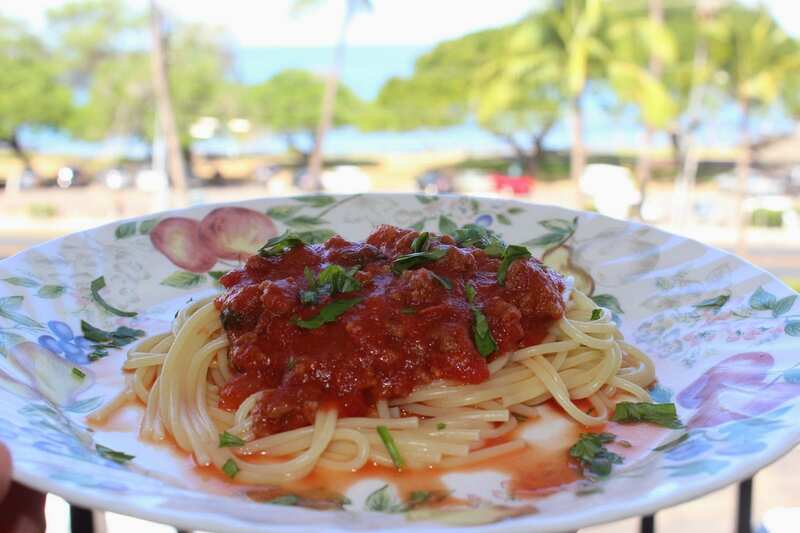 It’s a simple dish really….just spaghetti. I like using fresh basil when I make the red sauce. Right before serving the spaghetti, I garnished it with fresh basil and parsley. The herbs add a hint of freshness and my kids dig it. As I mentioned earlier, we wanted to keep it low-key so the rest of the morning and early afternoon was spent right across the street from our condo…Kamaole Beach III. I really enjoy having this access directly across from us. For the past 2-3 times we’ve gone here this week, this beach was never crowded. The difference this morning? The waves were stronger, there was a shore break warning so we had to proceed with caution. 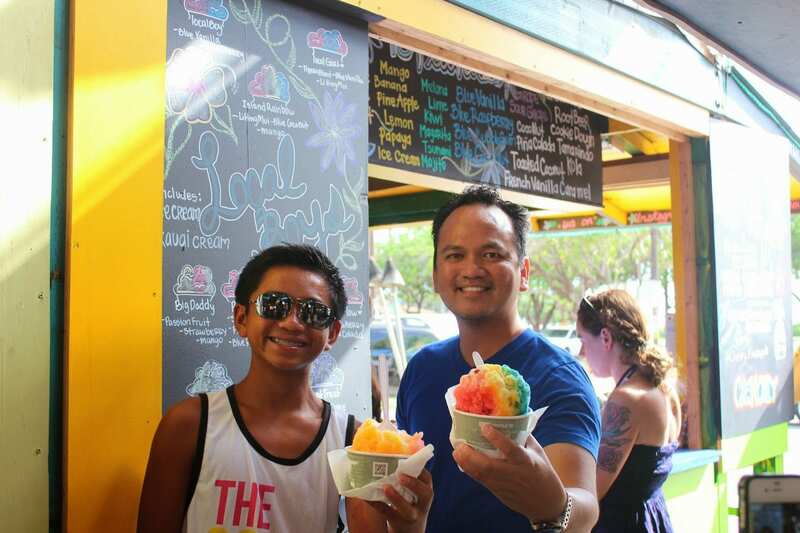 We found ourselves craving something cold so we went to Maui Gelato, and had shave ice at Local Boys on S. Kihei Road. Within the same compound was Three’s Bar and Grill. We ordered Kalua Pork Nachos, Tekka Maki, and Salmon Avocado Roll. 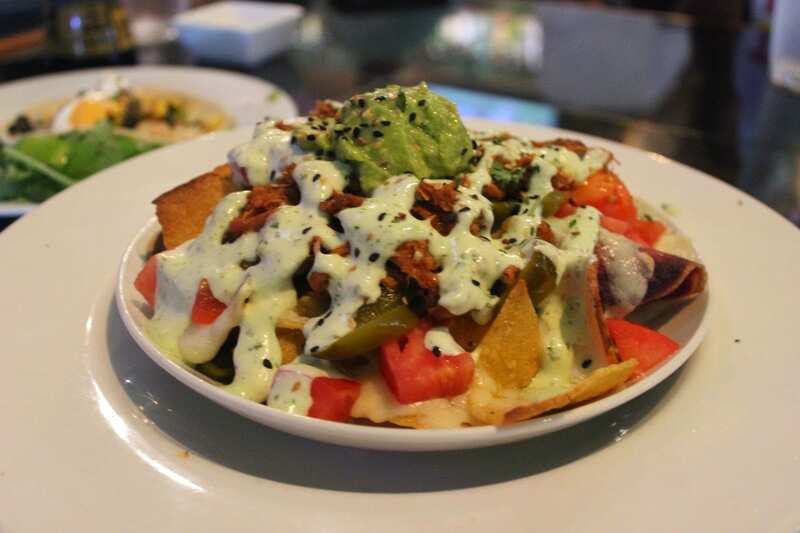 The highlight was the nachos and the star was the kalua pork….so tender, flavorful, blended perfectly with the Thai basil guacamole, pepperjack cheese, and truffle lime aioli. That was enough to keep us going. 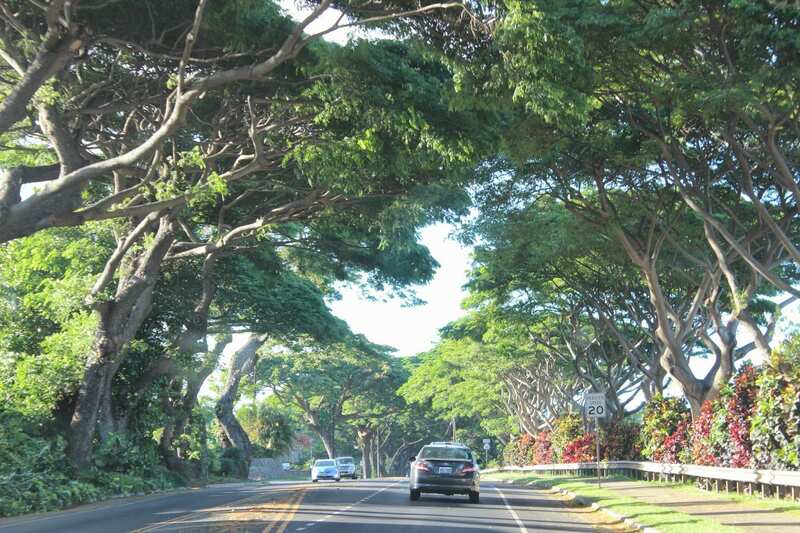 Honoapiilani Hwy towards Wailuku – love the trees! We drove towards Wailuku, and the GPS routed me towards Hwy 30 (Honoapiilani Hwy). I really enjoyed this drive….why? It was paved and straight! LOL. Kidding aside, I liked the trees lined up on the side of the road. They almost gave an impression of an umbrella effect which I thought was pretty cool. 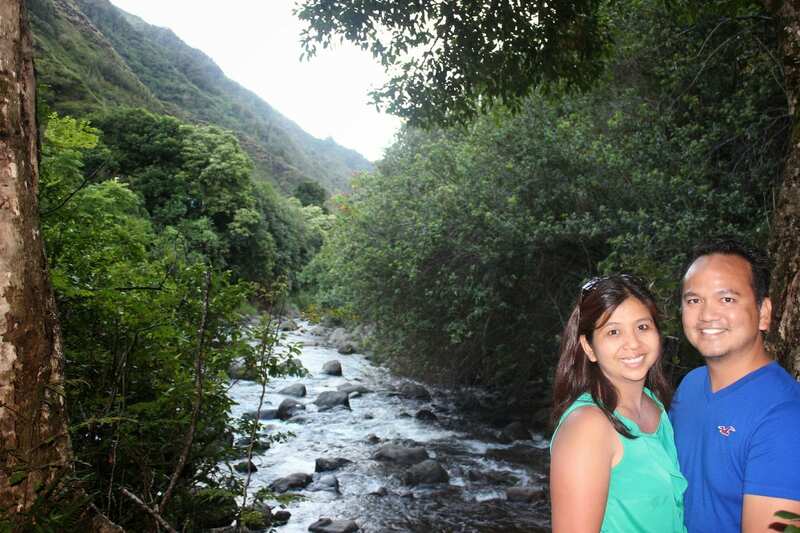 We pushed forward and found ourselves in Iao Valley. Again, I’ve been here, but I had forgotten the drive towards this valley. I’m really glad that I’m documenting this experience. 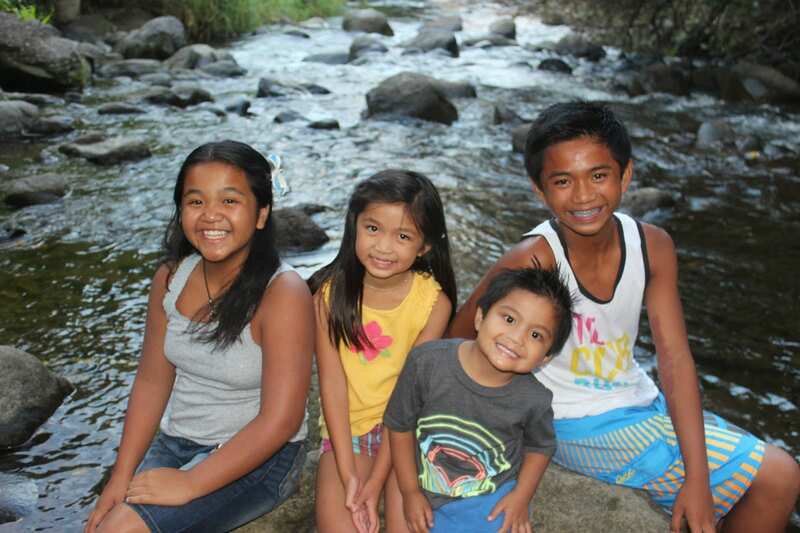 It was already late in the day when we got to Iao Valley (around 5:30pm and the park was scheduled to close at 7pm). After using the self-parking machine, we started to walk around. It was hard not to ignore the gushing stream of water. We then decided to make our way closer to the stream and found a good spot to take numerous pics of the kids and our entire family. By the time we finished, it was already getting dark and it was time to leave the peaceful, Iao Valley. We started to venture towards Kahului but shortly after leaving Iao Valley, I noticed a brightly lit establishment. There were quite a few locals so I decided to stop by. It was Ba Le Sandwich and Plate Lunch, a little Vietnamese outdoor restaurant (not sure if I can really call it a restaurant). You walk up to the outdoor counter, and you have a choice to eat at one of the benches, or take your food with you. I guess it is a restaurant hahahaahaha! We love Pho and with all the the plate lunches we’ve been having on the island, we needed a break. I asked the lady at the counter which Pho she recommended, and she said, “the special pho with flank steak, beef tendon, and meatballs.” So we ordered that pho and kalbi ribs plate for the kids. 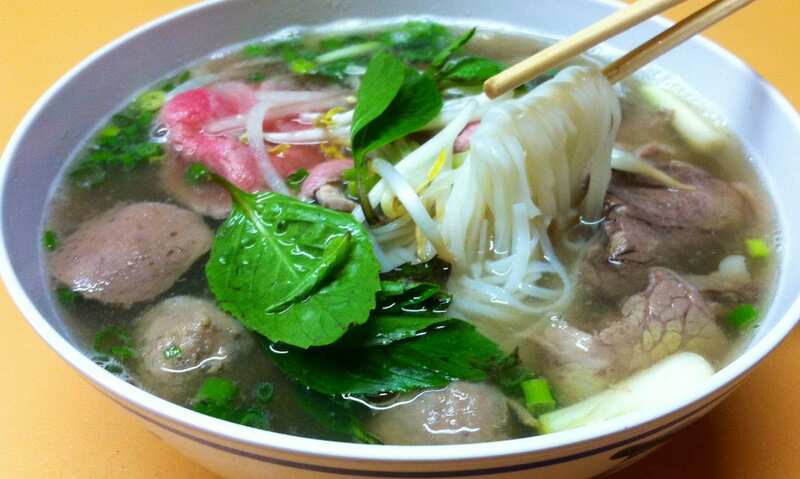 The Pho was exactly what we needed. It was served piping hot. The basil, jalapeño, and bean sprouts that came with it were uber fresh. The soup was savory. The bowl was big enough for us to share and we enjoyed every last ounce of that soup. We didn’t try anything else. I also found out that there are other Ba Le locations in Hawaii, so the next time I see one, I’ll make sure to not shy away and give it a try. So there, that’s Day Four….low-key much? You be the judge! Mahalo for following our journey.